Your little girl will look gorgeous for her birthday photos in this adorable white, red and black personalized gingham ladybug birthday tutu set. This set is pictured with a number 1, but You may personalize your set by having any Age, Initial or Name added. 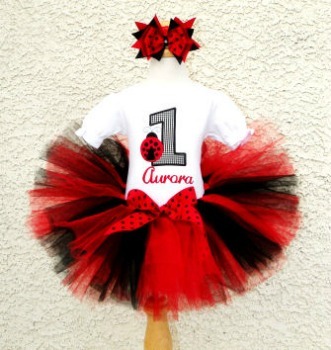 This White, Red and Black Ladybug Birthday Tutu Outfit set comes with a Personalized onesie or shirt, a matching Tutu, and a matching Headband Bow, or the option ofÂ 1 orÂ 2Â Hair Clip Bows.